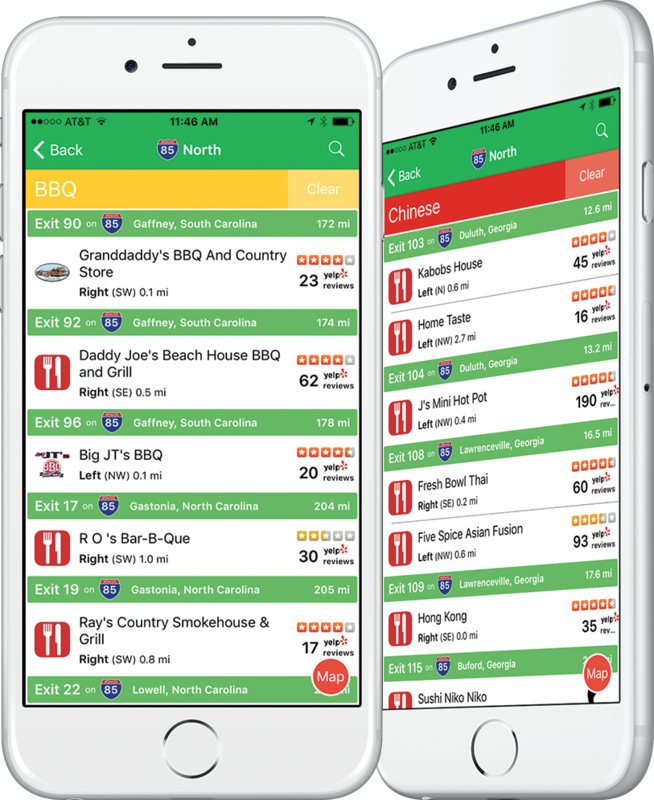 We’re excited to announce that iExit has teamed up with Yelp and now offers their ratings and reviews for Interstate-based businesses in our iOS app. We will be updating our Android app by the end of 2016 to do the same. Yelp is a popular service for finding and reviewing local businesses, and it has its own app and website to find great local businesses around your location. With today’s iOS update, we now allow Yelp’s ratings and reviews to be viewed by Interstate exit, making it easy to find a great restaurant or great hotel miles down the road. iExit has always been a great resource for finding brands you’re already familiar with, but with Yelp’s help, we can now help users discover previously-unknown, awesome new businesses ahead along the Interstate. The included screenshots show how iExit displays Yelp information when listing businesses at an exit. We display the 1 to 5 star rating for each business, along with the number of reviews, for every business in the list. If you’d like to learn more about a particular business, click on it to view its Business Details page, where we display the latest Yelp review written for that business. We also link directly to that business’s Yelp Profile if you’d like to read more reviews. We hope you like the new iOS update! Our Android update will be coming in December 2016. If you have any feedback please drop us a line at feedback@iexitapp.com and we’d love to hear from you.